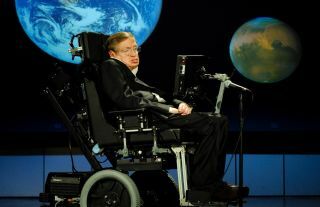 Stephen Hawking, of the University of Cambridge, delivers a speech about why humanity should go into space on April 21, 2008, at George Washington University. Stephen Hawking thinks humanity has only 1,000 years left of survival on Earth and that our species needs to colonize other planets. The famed physicist made the statement in a speech at Oxford University Union, in which he promoted the goal of searching for and colonizing Earth-like exoplanets. Developing the technology to allow humans to travel to and live on faraway alien worlds is a challenge, to say the least. But is Hawking right that humanity has only 1,000 years to figure it out? The dangers Hawking cited — from climate change, to nuclear weapons, to genetically engineered viruses — could indeed pose existential threats to our species, experts say, but predicting a millennium into the future is a murky business. If climate change continues apace, it will likely lead to a great deal of friction for the human species. "There may be incredible amounts of food and water stress in some regions; combined with sea-level rise, this will lead to massive numbers of environmental refugees — enough to make the Syrian diaspora seem simple to absorb," said Shawn Marshall, a professor of geography and a climate change researcher at the University of Calgary in Canada. Humanity is surviving now only by depleting the planet's natural resources and poisoning its environment, Sterman told Live Science. The nonprofit Global Footprint Network estimates that humanity uses up the resources of 1.5 Earths each year, essentially overdrawing from the planet's natural bank account. The problems of sustainability can't wait 1,000 years, Sterman said. "Whether we can prevent damaging climate change, and the broader issue of whether we can learn to live within the limits of our finite world, will likely be determined this century," he said. Emmanuel Vincent, a research scientist at the University of California, Merced and founder of the outreach organization Climate Feedback, echoed the call to make sustainable decisions now. In comparison, temperatures during the Jurassic and Cretaceous periods were about 10 degrees C (18 F) warmer than preindustrial averages, or about 25 degrees C (45 F) compared with today's 16 degrees C (29 F), Marshall said. Yet life was quite abundant at that time, he told Live Science. "It would be a habitable but rather different world," he said. "We'll run out of fossil fuels before we evaporate the oceans away." So humans probably won't manage to actually bake themselves in an oven made of greenhouse gases, though tropical areas may become too hot for habitation, Vincent said. The real question is whether humans would be able to handle the upheaval that climate change would bring as coastlines vanish, diseases spread and weather patterns change. "On its own, I don't see how climate change would lead to human extinction," Marshall said. "It would have to be through the social unrest triggering nuclear warfare, or some other societal implosion as a result of the environmental degradation." Already, there are warning signs beyond warming temperatures. About half of global wildlife has been wiped out over the past 50 years, Vincent said. The situation is serious enough that many scientists believe the planet is in the midst of its sixth mass extinction. "Anyone who thinks we can solve these problems by colonizing other worlds has been watching too much 'Star Trek,'" Sterman said. "We must learn to live sustainably here, on the one planet we have, and there is no time to lose."